A couple days ago, the Stack Overflow 404 page was changed to no longer contain the polyglot program that had been present since at least 2009. The given reason, according to Why was the 404 page changed to not include the "program"?, was to simplify and unify the codebase across the different implementations of Stack Overflow. 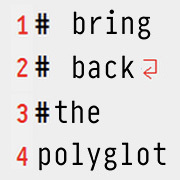 However, I strongly believe that the polyglot should be restored, because it's an important piece of Stack Overflow history. It's also resulted in a lot of broken links becoming even more broken, as people often linked to the 404 page to link to the polyglot. A lot of users have expressed disappointment for this change on the other question. If the given reason is that it was removed to unify the codebase, why not just implement it on all the different implementations (this site, Channels, and Enterprise), instead of specifically singling this site out as was done before? That reason allows implementing it on all or none of it, so just implement it on all of them. Update: Anyone who is interested in bringing it back can change their user icon to https://i.stack.imgur.com/U2NFN.jpg. Credit goes to the4kman in the answers. I understand and am empathetic towards the up voters desire to maintain this 404 page as is for historic reasons. However, for the reasons stated in my answer here we won't be reinstating it. Join me if you want. Not the answer you're looking for? Browse other questions tagged discussion feature-request status-declined design 404-not-found . What happened to the Stack Overflow podcasts? What to do when a user with high rep keeps posting bad questions and answers?